Want to support your heart health as you build whole body strength, flexibility and mobility? Decrease chronic stress to reduce the toll it takes on cardiovascular health. 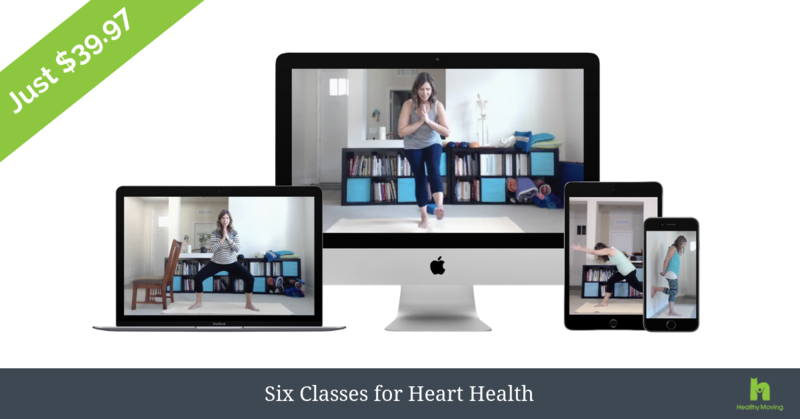 The Healthy Moving Heart Health Bundle is full of exercises and classes to provide you with a well-rounded healthy heart exercise routine! Classes in the bundle are valued at over $109, but they are bundled together so you can save over 63% and get lifetime access to this bundle for just $39.97! If you decide the class isn't for you, no problem! Just email billing@healthymoving.com within 30-days of purchasing, for a full refund. What level of experience is this program for? All levels! I teach poses and exercises progressively, first sharing the most basic alignment information. Then, I add layers of complexity for more experienced students. You will receive a welcome email with all of your course links and information. I am already a Coaching & Challenge Program Member, is this course included in my membership? Yup! This bundle (and the classes included) are part of the Coaching & Challenge Program member library. You can access the bundle or individual classes when logged in. Feel free to email support@healthymoving.com if you'd like direct links to the classes. I have purchased Healthy Moving courses in the past and already have a username and password. Can I use the same account for this purchase? Absolutely! If you have purchased other Healthy Moving courses and programs, you can use the same login credentials. Simply enter the email address associated with your Healthy Moving account when registering, so you can access all of your content under one username. There is another human growing in my belly right now. Do you offer prenatal modifications? Congratulations! I sure do. In fact, I’m pregnant in many of the videos on the site. It is so important to move your body during pregnancy, and I’m here to support you on that journey! What are the technical requirements to participate? You will need a high-speed internet connection to stream the videos. Will I receive a DVD or any other physical product with this purchase? Can I download the videos? This is a digital product. And all of the class videos are available for streaming only. You will be able to access them with the username and password you set up with your purchase. Additionally, you can download any PDFs that come with your bundle. Tell me about your certifications, Jen. Are you the real deal? I am a Certified Personal Trainer-Restorative Exercise Specialist™ (CPT-RES™), a Registered Yoga Teacher (eRYT-500) with Yoga Alliance and a member of the International Association of Yoga Therapists. I’m also a certified Restorative Yoga Teacher, and I have completed prenatal yoga training.